Sue Smith received a bouquet of flowers from the Chairman, Stewart Squires, on 2 December. Sue has served the Society faithfully as the clerk/typist and admin assistant at Jews’ Court for twenty years, for which we are all very grateful. Dr Tim Lomas, a member of the SLHA Local History Committee, is both Chairman-elect of the British Association for Local History and Vice President of the Historical Association. At Jews’ Court on Sunday 25 November he highlighted several current issues and trends from a national perspective. The number of local societies in the UK continues to grow, though the average age of participants is high and finding volunteers to run societies is often difficult. Archive material is being digitised on a huge scale for accessibility on the internet - excellent - but the quality and accuracy of the process is not always high. Joint funding is becoming the usual way of publishing books and achieving other projects. It is a matter of concern that teachers receive little training in the teaching of history and that as a consequence very little local history is taught in schools. In the early 19th century water was piped from the nearby river Witham to tanks in the roof of Belton House, where it was available in the event of fire. The gardens’ spectacular fountains were supplied from the same source. In a short illustrated talk at Jews’ Court on 25 November, Chris Lester quoted details from the original specification for the work and showed an illustration of the original waterwheel-driven pump by John Braithwaite, now at the Science Museum. The pump house, 12-foot wheel and sluice control still survive and have been surveyed by the SLHA IA team. More work has to be done to understand other aspects of water supply, drainage and sewerage at Belton house. The society is also assisting the National Trust in new interpretation of this aspect of the property. Excavations at Lincoln over the years have created a large legacy of medieval roof tiles fragments, but the potential value of this material remains largely untapped. In a short presentation at Jews’ Court on 25 November Alex Beeby explained how a type series has been set up which enables tile fragments to be classified according to easily identified features of tiles, such as nibs (protrusions to enable hanging), holes (for wooden peg hanging), colour and texture. Plain roofing tiles can also be differentiated from ridge and eaves tiles. If this work of classification was undertaken it would be possible to date the Lincoln tiles and locate where they were manufactured (there were 4 or 5 principal tile making communities in the county). A project is proposed to undertake this work using volunteers and drawing on Heritage Lottery Funds. On 14 November, four separate speakers brought news of finds in Lincolnshire to a large audience at St Hugh’s Church Hall, Lincoln. Dr Steve Malone of Archaeological Project Services reported on the long-term investigations of an Iron Age –Roman settlement being uncovered ahead of housing development in Market Deeping, close to the line of the major Roman route known as King Street and the presumed course of the Car Dyke. The settlement appeared to be defined by major tracks and ditch-systems, and recently some hearths had been identified which could be as late as Early Saxon in date. Mark Allen, a Director of Allen Archaeology, discussed the results of several investigations, including those in advance of the new Arts block at the Brayford campus of Lincoln University, which indicated that the area became increasingly wet from the Late Bronze Age. Excavations at Lincoln College had revealed features close to the eastern limit of the Dominican Friary (13th-16th centuries) and underlying Roman burials. In the grounds of the Old Palace, an early Roman wall and yard had been cut through later in the Roman period for a stone quarry pit. There were also medieval rubbish pits, probably associated with properties along the street to the north. Antony Lee of the Collection Museum described in detail some recent acquisitions by the museum, including rings and a bracelet. Craig Spence of Bishop Grosseteste University College was able to set the results of recent excavations in the area of the College library into the context of previous work there. There were both Roman buildings and, after a gap of c.600 years, a sequence of medieval houses, those of the 13th and 14th centuries being substantial stone structures. All fronted on to the Roman Ermine Street immediately west of the site or its wide medieval successor. On 17 October 2012, Dr Jon Henderson of Nottingham University described the work that he has been directing at Pavlopetri on the mainland of Greece - the subject of a BBC2 TV programme in October 2011. This project consists of an underwater exploration of a Bronze Age town just off shore; houses and tombs have been discovered, using the most advanced scanning and recording techniques. The finds suggested influence from the Minoan civilization of Crete. The annual SLHA Archaeology Day on Saturday 6 October broke new ground. The event was held at St Wulfram's Church, Grantham, rather than Lincoln and the contributions from seven eminent speakers, about churches and church architecture in Lincolnshire, were based on the relatively recent past. It was a most stimulating day for the audience of over 70 attendees and it seemed entirely appropriate to have lectures delivered from the pulpit of this fine church. The conference received a warm welcome by the Rector, Revd. Chris Andrews, and at the end of the afternoon Professor Philip Dixon led an informative tour of St Wulfram's, assuredly one of Lincolnshire's greatest churches. Though variable and uncontrollable, the power of the wind is free. Over the centuries man has devised machines using wind power to mill grain, drive drainage pumps, generate electricity and run other machinery. Speakers at SLHA's conference at Bishop Grosseteste University College on Saturday 22 September gave a history of wind-powered machinery from the mills of the medieval period to today's wind turbines. Special attention was paid to Lincolnshire's distinctive tower windmills and two speakers gave detailed accounts of restoration and operation in Moulton and Lincoln respectively. New Book: "Britons and Anglo-Saxons"
The History of Lincolnshire Committee launched the third of its Studies in the History of Lincolnshire when a group of members and friends celebrated Thomas Green’s book Britons and Anglo-Saxons: Lincolnshire AD 400-650 at Lincoln’s Assembly Rooms on 18 September. Dr Mick Jones, SLHA President, and Professor John Beckett, History of Lincolnshire Committee Chairman, spoke warmly about the significance of the study. Dr Green then outlined some of the key aspects of his book, which offers an interdisciplinary approach to the history of the Lincoln region in the post-Roman period. Some of the ideas he develops answer key questions regarding the origins of Anglo-Saxon kingdoms. A group of guests joined the author for photographs on the significant site of the church of St Paul in the Bail at the junction of Bailgate and Westgate. "Come into the Garden, Fanny” was the title of Jean Howard’s lecture to a packed audience at St Mary’s Church at Harrington on 12 September. Rosa, Fanny and Georgiana Baring lived at Harrington Hall with their mother and step-father Arthur Eden from 1831 to 1839. Fanny married Francis Massingberd, incumbent of nearby South Ormsby; Georgiana, a spinster, became embroiled in the famous case of the Tichborne Claimant; and Rosa was much admired by Alfred Tennyson (then living at Somersby) before marrying the wealthy Robert Shafto and travelling extensively. The diaries of Fanny and Rosa show what determined and capable women they were. This was the annual Leach Lecture, honouring Terence Leach, notable local historian and former SLHA Chairman. Beforehand, guests enjoyed a fine reception held in Harrington Hall, generously provided by the owners, David and Shervie Price. On 12 September Jim Brightman of Archaeological Research Services (Bakewell) described the recent exciting results from excavations at the hill-top of Fin Cop in Derbyshire. The site was known from previous investigations to include Bronze Age cairns within round barrows. Working with the Longstone Local History group, the latest survey and dig concentrated on a trench across the defences, which unexpectedly revealed human skeletal remains tossed into the ditch as the hill-fort’s use came to a (possibly violent) end in c.300BC. With the theme of "Trade and Travel” it is not surprising that Lincolnshire’s canals featured in this year’s HODs programme. Both the Horncastle Canal and the Grantham Canal were the subject of guided walks by SLHA members. Stewart Squires took a party along the Grantham Canal from Woolsthorpe looking at the canal and its relationship with Sewstern and Longmoor Lanes. The party also learned how locally-mined ironstone was transported by inclined plane and railway and the impact which mining had on the landscape. The walk finished with a visit to the canal workshop to see displays mounted by the Grantham Canal Society. Ken Redmore took two parties around Horncastle to see features of its canal. He described how the rivers Waring and Bain were adapted to provide two basins for the town. When the canal was opened there was a dramatic drop in the price of coal and the cost of "exporting” local produce, both of which helped to stimulate the town’s economy. Whilst the canal is no longer useable, plenty of evidence, including wharves and fine warehouses, survive. Society's boat "The Three Shires"
The University of Kent are currently digging at Otby Top in Claxby parish on the site of a late Iron Age/Roman enclosure identified from crop-marks. They have discovered the corner of the enclosure ditch, but are struggling to make sense of evidence for a hut within. Other structures are known down in the valley to the west. The photo shows several features including post-holes. The site was visited by a SLHA small group on Sunday 26 August. A concise and lavishly illustrated book on Lincolnshire’s distinctive breeds of farm animals was launched at Heckington Show on 29 July. Written by Catherine Wilson, OBE, former SLHA President, and published by the Society, the book was commissioned by the Heckington and District Agricultural Society. The Lord Lieutenant of Lincolnshire (Tony Worth) and SLHA Chairman (Stewart Squires) congratulated Catherine and commended the book. Sue and Alan Stennett, both heavily involved in the protection and promotion of rare breeds, had provided information and photographs for the book. 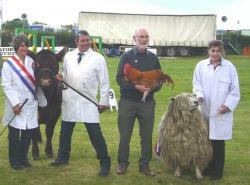 It was appropriate that Alan, the veteran broadcaster, was compere for the public launch of the book in Heckington’s main show ring accompanied by prize-winning animals: a Lincoln Red cow, a Lincoln Longwool sheep and a Lincolnshire Buff cockerel. Despite dodging the showers and flooded roads, this year’s annual weekend trip, meticulously researched and organised by Ken Hollamby, proved to be yet another good mix of historical sites. Our accommodation was at the University of Chichester, where we were given a tour around some of the older college buildings, including the lecture room used for coordinating operations during the D-Day landings in 1945. In the evening we were guided around the ancient walls of the city and learnt about the construction and function of the bastions. On Saturday we visited Fishbourne Roman Palace, where our guide pointed out the several deliberate errors in the famous ‘cupid on a dolphin’ mosaic. In the afternoon, we explored the timber-framed buildings of the Weald and Downland Open Air Museum, including Bayleaf Farmhouse, one of 47 vernacular buildings rescued from the south and east of England. Our visit to Amberley Museum on Sunday coincided with Railway Gala weekend, and whilst some of us stayed on in the afternoon to further enjoy the exhibits others travelled to nearby Arundel Castle, whose grounds include the theatrical Duke’s Garden. Our trip concluded on Monday with a foray around Fort Cumberland near Portsmouth and a guided tour of English Heritage’s archaeological laboratories housed within its ramparts. Why So Many Methodist Chapels? The annual Brackenbury Lecture was held, as is the custom, at Raithby Chapel near Spilsby on the second Saturday in July. Mervyn White of the Lincolnshire Methodist History Society, described the sequence of splinters in the church from Wesley’s death to the end of the 19th century, and its impact on chapel building in Lincolnshire. It was interesting to note that the Spilsby area remained more solidly Wesleyan than almost any other part of the county. At an afternoon session in Heighington on 7 July SLHA members considered the current performance of the society and the ways in which it might develop and improve. A wide range of useful suggestions were made which will be considered for implementation in the near future. We are grateful to Kate Mitchell for her professional leadership of the workshop – a pleasant and productive event. As part of the continuing development of the Society website the web address "www.lincolnshirepast.org.uk" was discontinued in favour of www.slha.org.uk. Unfortunately the old address still exists on some literature and use of the address does launch the correct website at the moment but this cannot continue indefinitely so please check that you have the correct (www.slha.org.uk) address stored in your browser. The walk around Willoughton on 1 July, led by Mrs Sarah Taylor, was a bit different from the usual. Sarah and her fellow local historians have studied local traders from the 18th century to present and recorded their premises in Willoughton. The walk entailed looking at the premises, now altered considerably, or the location, now the site of a 20th century dwelling. She introduced the party to the various traders and their families and had stories to tell of their ups and downs. After the walk there was tea in the Village Hall, during which there was a programme with photographs of the views we have witnessed but from past years such as a house as a cycle shop with the first petrol pump in the village. The afternoon had a very personal flavour with the addition of some past villagers sharing their memories. Approximately 170 people came to the Spalding Local History Fair organised jointly by the SLHA and Ayscoughfee Hall. There were 18 stands representing a wide range of interests from Archaeology to Windmills and it was good to see one of Lincolnshire's newest heritage attractions, Chain Bridge Forge, present. It was an opportunity to learn about events and personalities in the area and further afield, to meet friends and to enjoy the atmosphere in one of Lincolnshire's outstanding buildings. Particular thanks go to Dennis Wolfe (SLHA South Holland Group), Rod Callow (SLHA Administrator) and Julia Knight (Ayscoughfee Hall) for organising the event. The SLHA 2012 AGM was held at Stamford Arts Centre on Saturday 16 June. Mick Jones, SLHA President, welcomed over 50 members to the meeting. SLHA Chairman, Stewart Squires, presented the annual report and drew attention to the large number and variety of society activities held over the past year. He also commended the society’s involvement in Heritage Open Days and similar festivals, as well as the work of individuals in speaking to the media on behalf of the society. A copy of the illustrated Annual Report can be viewed here. The Society’s special awards were announced at the AGM on 16 June. The Flora Murray Award for 2011 was presented to the Pickworth Local History Group in recognition of their excellent work in publishing books about the village and its school and in creating an informative website. Norman Whiting received the award on behalf of the group. See the Pickworth Village Website. Awards of Excellence were made to History of Saxilby & District Group for the well-constructed village trail they had devised, and to Dr Katharine Sykes for her book Inventing Sempringham about the Gilbertine order, founded in Lincolnshire. Read more about History of Saxilby and District Group and Katharine Sykes. On the afternoon of 16 June, following the AGM, SLHA members visited some of Stamford’s magnificent stone buildings based on a route and information provided by Leo Tours (Jean Orpin and Susan Lee). Special visits were made to Browne’s Hospital and the churches of All Saints and St John, where David Stocker provided an introduction to their architectural and historical significance. The subject of the archaeology talk on 13 June was the Anglo-Saxon kingdom of Kent. The speaker, Dr Andrew Richardson of the Canterbury Archaeological Trust, is an expert on brooches of this period, many of which have been found in cemetery excavations. He has been able to identify elements that were distinctively Kentish, but with close parallels in Hampshire and the Isle of Wight. There were links with Jutland, later superseded by influences from Gaul, but from the 7th century the kingdom was overshadowed by East Anglia. The Society was proud to be represented at the Queen’s Diamond Jubilee Picnic at Burghley House on Wednesday 13 June along with representatives of other leading organisations in the county. On a very warm afternoon SLHA members Ken Redmore and Stewart Squires led a group of 40 walkers on the canal towpath from Horncastle to Thornton and back along the Spa Trail, the former Woodhall-Horncastle railway line. Beginning at the town swimming pool (once the canal’s dry dock), stops were made at the first lock, Thornton Lodge railway crossing, in front of fine sculptures alongside the Spa Trail and finally on the site of Horncastle railway station. The Horncastle Navigation opened in 1802 and closed 1889. The Horncastle to Woodhall Junction Railway opened in 1855, ceased to carry passengers in 1954 and goods in 1971. The SLHA Industrial Archaeology team and the Dogdyke Pumping Station Preservation Trust joined forces on 21 May for a visit to the pumping station at Pyewipe on the Fossdyke to the west of Lincoln (SK 954720). They were generously entertained by the Chairman, Chief Executive, Engineer and other staff members of the Upper Witham Internal Drainage Board. The Gwynnes pumps driven by Ruston and Hornsby diesel engines – all made by Lincoln firms - of the original pumping station of 1936 were operated for the visitors. Water was drawn at an impressive rate from the drain serving some 3300 hectares of land to the south and discharged into the adjacent Fossdyke Canal. These pumps, kept in exemplary condition, provide back-up to the electrically operated pumps installed in 1993. Close by the pumping station is the cast iron tunnel with large concave brick portals designed by John Rennie in 1805-08 to transfer water from the Burton Main Drain to the north-west under the Fossdyke canal to the Skellingthorpe Main Drain to the south. This is a most interesting and important survival. On 16 May, Gareth Perry, a doctoral research student at Sheffield University, spoke about his research on the earlier uses of the Anglo-Saxon cremation urns from Cleatham and Elsham in North Lincolnshire. His study has employed analysis of both residues and types of surface wear to suggest that certain pots were used for fermentation of beer or for dairying in advance of their later consignment to the earth as cremation urns. This is a controversial hypothesis, but the results of the analysis convinced many in the audience, and we look forward to seeing Gareth’s researches concluded and published. Over 80 people, most of them SLHA members, attended a conference on the theme of Lincolnshire Estates at Riseholme Hall, University of Lincoln, on Saturday 5 May. We are grateful to the Local History team, especially Pearl Wheatley, for devising an excellent programme, and to Rod Callow, SLHA Administrator, for meticulous organisation of the conference. Catering and hospitality provided by the University were, as always, to a very high standard. A coach outing to Ellys Manor House, Great Ponton, and 'Rocks by Rail' (Rutland Railway Museum), Ashwell, was enjoyed by thirty SLHA members on Saturday 21 April. The Manor House was rebuilt in stone in the Tudor period by the Ellys family, wealthy Lincolnshire wool merchants. Its distinctive crow-stepped gable on the prominent eastern elevation is similar to contemporary houses in northern Europe of the Renaissance period. Of outstanding interest are the early 16th century wall paintings on the first floor, widely recognised as among the country’s best examples in a domestic setting. The Ellyses were also responsible for rebuilding the large tower of Holy Cross church adjacent to the Manor House in 1519. The afternoon was spent at the Rutland Railway Museum near Ashwell which is currently being upgraded and re-branded as 'Rocks by Rail'. The museum location is the railhead for an extensive area of ironstone quarries which were served by a network of temporary lines, though only a relatively short section of line survives. There are a large collection of working locomotives, almost all of which worked in ironstone quarries here or elsewhere, a wide range of wagons and other related rolling stock, and excavators to undertake quarry work. Thanks to Ken Hollamby for organising the outing; to Clive Taylor, owner of Ellys Manor; and to the knowledgeable volunteer guides at 'Rocks by Rail'. The winner of the 2012 Undergraduate Dissertation prize awarded by the Royal Historical Society in association with the magazine History Today is Richard Lowe-Lauri of the University of Durham. His study on the famous bull-running in Stamford was considered by the judges "a remarkable review of the historiography of an increasing compassion for animals, set within a wider debate over changing leisure patterns and the decline of traditional sports in a rapidly industrialising Britain". An extract from the dissertation will appear in a future edition of History Today. On 18 April Dr David Taylor of the University of Nottingham spoke to a large audience, swelled by the presence of several Cathedral Guides, about his research on the early west front of the Cathedral. David has spent several years exploring the many chambers and voids and recording them stone by stone. As a result he has been able to suggest that there were three Romanesque phases, the second a rebuild of the first, and the final one begun by Bishop Alexander and completed by his successor Chesney. The research has already produced an article in the latest issue of The Archaeological Journal and a book on the form of the Cathedral before St Hugh is planned in conjunction with Professors Philip Dixon and David Stocker. This publication will explain the functions of the various chambers, from the huge garderobe in the north-west corner to the tiny rooms provisionally interpreted as singers' holes. Members of the SLHA Industrial Archaeology team visited sites in and around Sutton Bridge on Thursday 22 March. David Clowes and Beryl Jackson (local SLHA members) were the guides and interpreters of the complex system of sluices and bridges where the North Level Main Drain joins the River Nene at Foul Anchor to the east of Tydd Gote (TF 467180). The history of drainage of this area bordering Lincolnshire, Cambridgeshire and Norfolk is long and involved; there are helpful modern interpretation boards at two sites; examination of Beryl’s comprehensive collection of maps, diagrams and photographs was also invaluable. In the afternoon we looked at the remains of the former Sutton Bridge Dock, now the site of the local Golf Club. The 13-acre dock was completed in 1881, but within a few weeks several lengths of the concrete faced banks had collapsed and could not be satisfactorily repaired and stabilised. The overall profile of the dock can still be recognised and several features remain, notably the 750-foot timber jetty along the face the south-east quay. Measurements and photographs were taken for a full report which will appear in the society’s journal in due course. We are grateful to Norman Davis, our guide, and members of the Sutton Bridge Golf Club for allowing access. Neil Wright's recent book Sutton Bridge: An Industrial History gives full details of the dock's construction and demise. Revd Canon David Pink, who died on 15 February in Swarby, served almost all his priesthood in the Lincoln Diocese. He read History at Cambridge and throughout his life maintained an active interest in the subject, both as a writer and speaker. At one time he was a member of the SLHA Local History Committee; he was also an active member of the Lincoln Record Society, and served on the Council of the Historical Association. Another successful "Sunday Special" provided 3 short talks on varied themes to a packed audience at Jews' Court on 18 March. Dr Erin Bell of the University of Lincoln spoke about Women Quakers. The Society of Friends, almost alone amongst the Christian denominations, had women taking leadership roles as early as the seventeenth century. In the late 18th and early 19th centuries women Quakers were also prominent in actively opposing the Slave Trade. Decorative items with anti-slavery inscriptions were manufactured for personal wear and household use. The recently published SLHA book "Growing Better: Lincolnshire and the Potato" was the subject of the talk given by Stewart Squires, one of the book's joint-editors. He underlined the significance of Lincolnshire in the development of the potato industry and used a selection of the book's excellent photographs to illustrate potato planting, cropping, storing, processing and eating over the years. Paul Cope-Faulkner, from Archaeological Project Services, Heckington, has worked with local volunteers to excavate part of the extensive Benedictine abbey site at Bardney. The refectory, with its benches and table supports, has received special attention. He explained that much of the work has allowed a close comparison with the excavation carried out in 1909 by Revd Charles Laing, which was well photographed at the time. An exhibition about the recent work and its finds is to be held in the parish church. At an SLHA meeting in Lincoln on 14 March, Barbara Tratsaert described her research into Roman gold-mining in eastern Egypt. Her interest in that region stemmed from participation in the international project at Berenike, an important Red Sea port in southern Egypt in antiquity. Barbara Tratsaert examined the evidence for techniques used in extracting the gold, and compared them to those investigated in the gold-mines in North-West Spain and at Dolaucothi in south-west Wales. She has also demonstrated that the people used in mining were skilled technicians, not unskilled slave labour. On 7 March members of the SLHA Industrial Archaeology team were given a special tour of the impressive laboratories and teaching rooms in the recently established engineering faculty at the University of Lincoln. Dr David Waugh was our informative and lively guide. We were given a taste of the wide range of projects being undertaken by David and his colleagues and were introduced to the latest equipment in several fields of engineering. The international engineering firm Siemens have played a major role in funding the building and its facilties and the Lincoln-based plant now conducts all its staff and apprentice training alongside the University in its new building. SLHA members hope that both staff and students will be given a clear reminder of the great engineering heritage of the city. On 15 February Vicki Score of University of Leicester Archaeological Services described the remarkable Hallaton treasure and its possible significance. This was a surprise discovery of large groups of over 5000 silver and gold Late Iron Age coins, principally dating to the last generation before the Roman conquest, found at an unpromising location in Leicestershire in 2001. There were also some surprising but valuable objects, including a silver bowl and a Roman parade helmet whose conservation and detailed decoration has recently received national publicity (the coins themselves have previously featured in Hello! magazine!). On the other side of a ditch with an entrance (‘guarded' by a carefully-buried large dog) were a large number of pig bones, presumably from feasts. Detailed study of the coins and the names on them at the British Museum has suggested that this may have been a meeting place for leaders of various sub-tribes of the Corieltavi. The finds are now on display at Harborough Museum. The annual SLHA residential conference was held at Bishop Grosseteste University College over the weekend 10 to 12 February on the theme of Non-Conformity. On Saturday afternoon visits were made to two Lincoln High Street churches: the Unitarian Chapel and Central Methodist Church. The South Holland History Group enjoyed a very interesting and well presented talk by Julia Knight, the Museum Officer, about Ayscoughfee Hall in Spalding on 27 January. This beautiful house was built about 1420 for Richard Ailwyn, a wool merchant, and it is believed that it was granted to Sir William Ayscough from Stallingborough in north Lincolnshire sometime after 1506. The hall was subsequently known as Ayscoughfee, the suffix signifying the territorial grant made to a knight of the realm. No records exist of the Ayscoughs actually living at the hall although the second son, Sir William Ayscough, sometimes lived in Spalding. A number of different families occupied the hall after 1520, the most well known of which were the Johnsons, who were there until 1851. The hall and gardens were sold by Isabelle Johnson to a committee of Spalding citizens in 1898 for sum of £2100. Thus the building came into public use, and today is administered by South Holland District Council on behalf of the people of Spalding. This Grade One building has exceptional quality and the townspeople are rightly proud of their great house. In the now well-established tradition, SLHA members were treated to a variety of short but entertaining talks in a "Sunday Special" on 22 January. Ken Hollamby gave an illustrated preview of the attractions in West Sussex and Hampshire being visited in this year's study tour. These include Chichester (where the University provide our accommodation), Fishbourne Roman Palace, Weald and Downland Museum, Amberley Museum, Arundel Castle and Cathedral, and Fort Cumberland. We hope this very interesting programme attracts a large group. Recent acquisitions at The Collection were the theme of Antony Lee's talk. He first mentioned the Roman intaglio ring, Anglo-Saxon pendant (right), bronze boar statuette and Roman gold coins already featured in Lincolnshire Past and Present, and then described in detail six gold coins, minted under Charles V of Spain in the period 1790-1801, which are part of a much larger hoard found near Lincoln over recent years. The museum has also recently acquired a Chinese Hellbank Note, of no monetary value as currency but burnt at funerals as part of a traditional ritual. Dave Kenyon of the University of Lincoln spoke about George Boole (1815-1864), who was born in humble circumstances in Lincoln. Boole developed his interest in Mathematics while running a small school in Pottergate in the city (left) and the exceptional quality of his work led to a professorship in Maths at Queen's College Cork. His seminal work on the logic (Boolean Algebra) which underpins computer science is widely recognised. Dave is doing all he can to ensure there will be appropriate international celebrations of Boole's birth/death in 2014/15. Read a more detailed biography. The opening archaeology lecture of the 2012 season on 18 January provided City Archaeologist Mick Jones with an opportunity to describe the highlights of fieldwork and research in Lincoln in the past year. Among the excavations summarised were investigations at both Bishop Grossesteste University College, where work adjacent to the library revealed Roman and medieval suburban remains, and at Lincoln College, where Roman burials as well as occupation associated with the Dominican Friary to the west were uncovered. A trench at Edward King House also found medieval pits and part of a Roman building, and on Auden Close more graves were found, within the precinct of medieval St Giles' hospital. More details of these excavations and others outside the city will be given at the 14 November meeting by the excavators themselves. The talk also included news on recent publications and current post-excavation work on Lincoln, including both popular books and the two final volumes in the Lincoln Archaeological Studies series. The progress report on repairs to and interpretation of visible remains included the Roman east gate and St Paul-in-the Bail, where improved lighting of the well and a new panel about its contents have now been installed. Long-standing SLHA members, Dennis and Joan Mills, have recently been made Life Members of the Society in recognition of their outstanding contribution. Through their research and publications, as well as their advice and willingness to share their experience, they are inspirational members of the Society. In March 2011 SLHA published Lincoln Connections: Aspects of City and County since 1700 as a tribute to Dennis on his eightieth birthday.